EDWARDSVILLE — A national symposium on science, technology and mathematics will be held at Lewis and Clark Community College’s fabrication lab next year, the college recently announced. The St. Louis Confluence Fab Lab opened at the college’s N.O. Nelson campus in Edwardsville late last year. The 5,000-square-foot laboratory offers a complete wood shop, metal shop, paint booth and state-of-the-art fabrication equipment to members. The goal of the lab is to offer manufacturing and innovation tools to the general public and students for small-scale production in the St. Louis area. The United States Fab Lab network will hold its annual symposium March 13 through 15 next year. The network promotes collaboration between Fab Labs, of which there are approximately 60 member labs, according to Greg Herker, the network’s director of communications and board chairman. 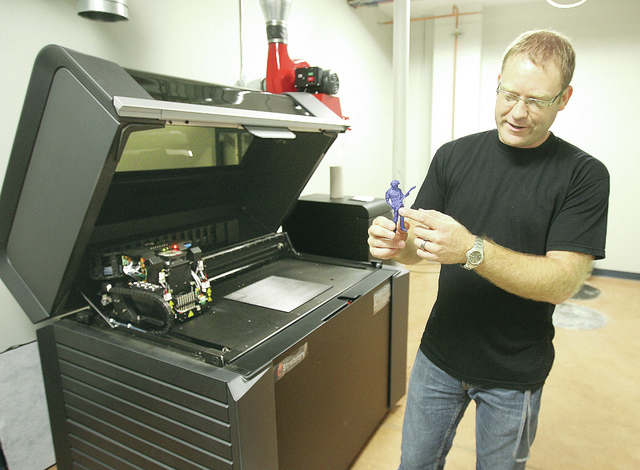 Herker said attendees of the event, between 100 and 150 of them, will have a chance to watch demonstrations, take advantage of training sessions, communicate with peers and generally see what’s new in the world of digital fabrication. The symposium is open to the public.